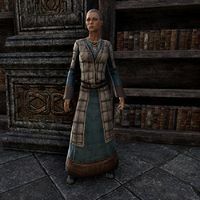 Julupe is a Redguard mage who can be found on the upper level of the Mages Guild of Daggerfall. When approached, she says, "I can't decide what I want to read next. Should I go with something scholarly such as Glenumbra's People? Or am I in the mood for something a little lighter? Perhaps Lady Veronica's Best Friend? Decisions, decisions ...."
This page was last modified on 7 April 2018, at 01:09.